This extensive library houses many forms of written historical data including over 2,000 books, primarily of Australian and New Zealand military history, dating from pre Boer War and pre Federation to the present. Hundreds of files are made up of original military documents, photographs, maps and correspondence. The museum also holds a large collection of serviceman's diaries. 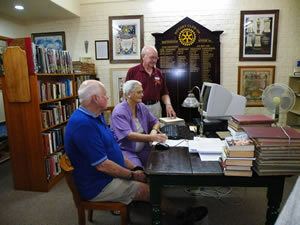 Newspapers and periodicals include The Sydney Mail from 1915 to 1918 and The Queenslander Pictorial from 1914 to 1927. Using the detailed computer cataloguing system any book or file may be found by using author's name, subject, family name or period. Researchers and family historians may use the comfortably appointed and air conditioned Research Room as pictured. Photocopying facilities are available. Prior notice of your visit, and the person or period you are researching, would be appreciated by the museum. This information allows us to be prepared for your visit and for library volunteers to be available to assist you. "Just a note to let you know how much I appreciated being allowed to use your wonderful research library at the museum. The collection of books individually and collectively are a valuable and comprehensive research facility that has been particularly helpful to me. 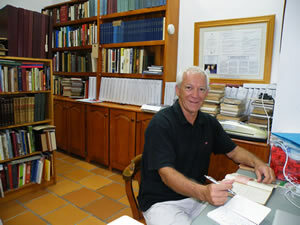 I would like to pay a special thanks to John Mager who came in early for me to have a little more time in the library. Gloria Banting also showed such immence passion for the museum's displays that I was inspired to loan a collection of memorabilia belonging to William Walter Dumbrell, who was one of the 30 Queensland police officers killed during the Great War. Once again, I would like to thank you for the use of the museum library and hope it is not too long before I can visit new found friends and to continue my research." NOTE: Photocopying, scanning of documents and photographs, and research do not have a charge, but require a donation to the museum. The Maryborough Military and Colonial Museum is the headquarters in Queensland for the Military Historical Society of Australia (Queensland branch). have an interest in military history – Army, Navy or Airforce? want to find out more about your relatives' active service? want to meet others with similar military interests? have general interests in Australian military activities? 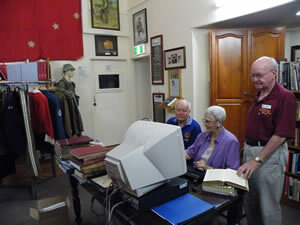 The Military Historical Society of Australia may be for you! For more information on MHSA go to their website .... or contact us. Access to a computer and a photocopier are available to researchers. 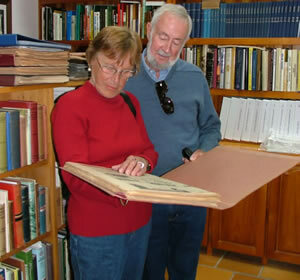 Museum volunteers are available to help historians in the Research Room. Historians read a copy of an historic newspaper. Researcher Neil Dearberg from Maroochydore said the library was, "A brilliant resource for people in regional areas to access without having to go to the major cities".